This twelfth article, which is part of the series on Linux device drivers, gets you further with writing your first USB driver in Linux – a continuation from the previous article. Control – For transferring control information. Examples include resetting the device, querying information about the device, etc. All USB devices always have the default control endpoint point zero. Interrupt – For small and fast data transfer, typically of up to 8 bytes. Examples include data transfer for serial ports, human interface devices (HIDs) like keyboard, mouse, etc. Bulk – For big but comparatively slow data transfer. A typical example is data transfers for mass storage devices. Isochronous – For big data transfer with bandwidth guarantee, though data integrity may not be guaranteed. Typical practical usage examples include transfers of time-sensitive data like of audio, video, etc. Additionally, all but control endpoints could be “in” or “out”, indicating its direction of data transfer. “in” indicates data flow from USB device to the host machine and “out” indicates data flow from the host machine to USB device. Technically, an endpoint is identified using a 8-bit number, most significant bit (MSB) of which indicates the direction – 0 meaning out, and 1 meaning in. Control endpoints are bi-directional and the MSB is ignored. Figure 19 shows a typical snippet of USB device specifications for devices connected on a system. To be specific, the “E: ” lines in the figure shows example of an interrupt endpoint of a UHCI Host Controller and two bulk endpoints of the pen drive under consideration. Also, the endpoint numbers (in hex) are respectively 0x81, 0x01, 0x82. The MSB of the first and third being 1 indicating “in” endpoints, represented by “(I)” in the figure. Second one is an “(O)” for the “out” endpoint. “MaxPS” specifies the maximum packet size, i.e. the data size that can be transferred in a single go. Again as expected, for the interrupt endpoint it is 2 (<= 8), and 64 for the bulk endpoints. “Ivl” specifies the interval in milliseconds to be given between two consecutive data packet transfers for proper transfer and is more significant for the interrupt endpoints. As we have just discussed the “E: ” line, it is right time to decode the relevant fields of others as well. In short, these lines in a USB device section gives the complete overview of the USB device as per the USB specifications, as discussed in our previous article. Refer back to Figure 19. The first letter of the first line of every device section is a “T” indicating the position of the device in the USB tree, uniquely identified by the triplet <usb bus number, usb tree level, usb port>. “D” represents the device descriptor containing at least the device version, device class/category, and the number of configurations available for this device. There would be as many “C” lines as the number of configurations, typically one. “C” represents the configuration descriptor containing its index, device attributes in this configuration, maximum power (actually current) the device would draw in this configuration, and the number of interfaces under this configuration. Depending on that there would be at least that many “I” lines. There could be more in case of an interface having alternates, i.e. same interface number but with different properties – a typical scenario for web-cams. “I” represents the interface descriptor with its index, alternate number, functionality class/category of this interface, driver associated with this interface, and the number of endpoints under this interface. The interface class may or may not be same as that of the device class. And depending on the number of endpoints, there would be as many “E” lines, details of which have already been discussed above. The “*” after the “C” & “I” represents the currently active configuration and interface, respectively. “P” line provides the vendor id, product id, and the product revision. “S” lines are string descriptors showing up some vendor specific descriptive information about the device. 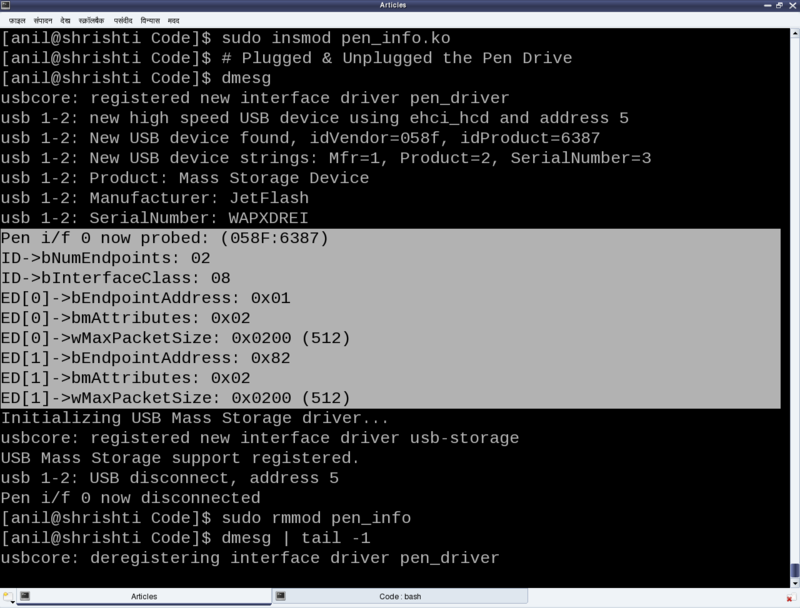 Build the driver (pen_info.ko file) by running make. Load the driver using insmod pen_info.ko. Plug-in the pen drive (after making sure that usb-storage driver is not already loaded). Check the output of dmesg for the logs. Unload the driver using rmmod pen_info. Figure 22 shows a snippet of the above steps on Pugs’ system. Remember to ensure (in the output of cat /proc/bus/usb/devices) that the usual usb-storage driver is not the one associated with the pen drive interface, rather it should be the pen_info driver. Before taking another break, Pugs shared two of the many mechanisms for a driver to specify its device to the USB core, using the struct usb_device_id table. First one is by specifying the <vendor id, product id> pair using the USB_DEVICE() macro (as done above), and the second one is by specifying the device class/category using the USB_DEVICE_INFO() macro. 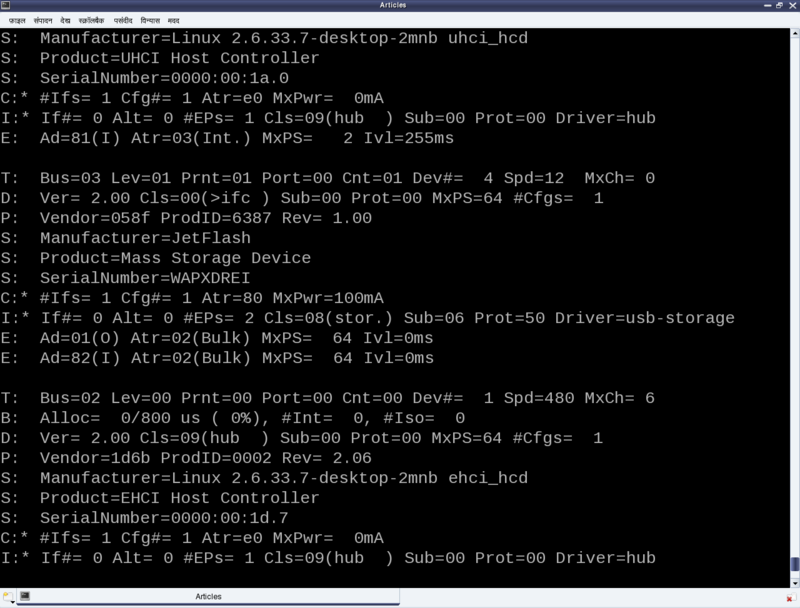 In fact, many more macros are available in <linux/usb.h> for various combinations. Moreover, multiple of these macros could be specified in the usb_device_id table (terminated by a null entry), for matching with any one of the criteria, enabling to write a single driver for possibly many devices. “Earlier you mentioned writing multiple drivers for a single device, as well. Basically, how do we selectively register or not register a particular interface of a USB device?”, queried Shweta. “Sure. That’s next in line of our discussion, along with the ultimate task in any device driver – the data transfer mechanisms” replied Pugs. This entry was posted in Linux Device Drivers and tagged Device Drivers, LFY, Linux, OSFY, USB Device Drivers, USB Drivers on January 1, 2014 by Anil Kumar Pugalia. 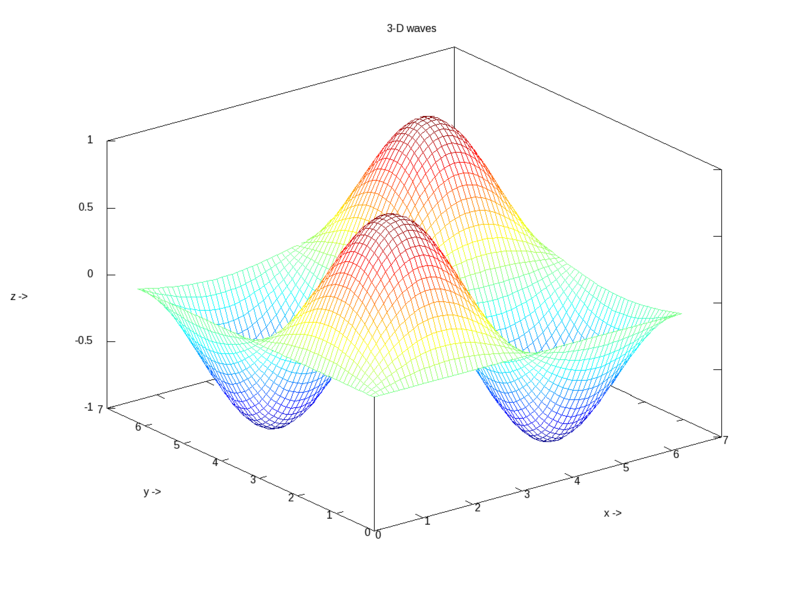 This twelfth article of the mathematical journey through open source, shows the mathematical visualization in octave. Mathematics is incomplete without visualization, without drawing the results, and without plotting the graphs. 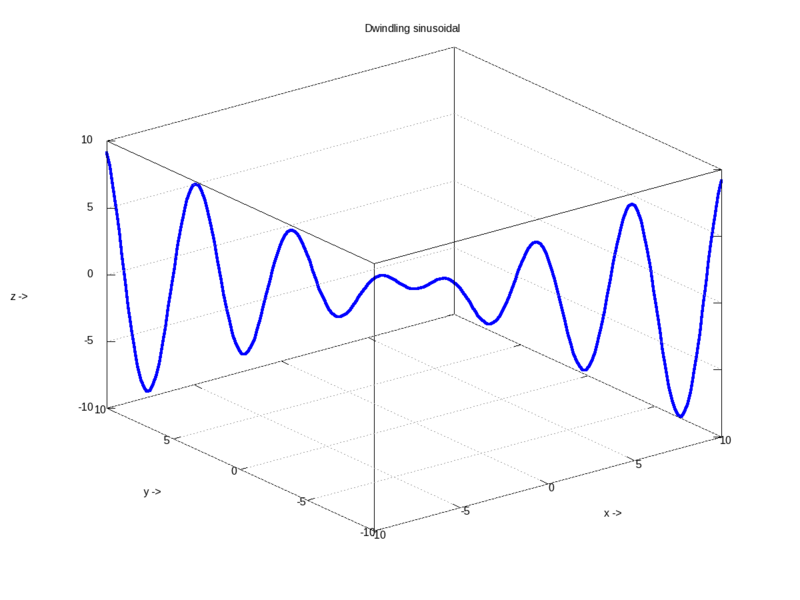 octave uses the powerful gnuplot as the backend of its plotting functionality. And in the frontend provides various plotting functions. Let’s look at the most beautiful ones. 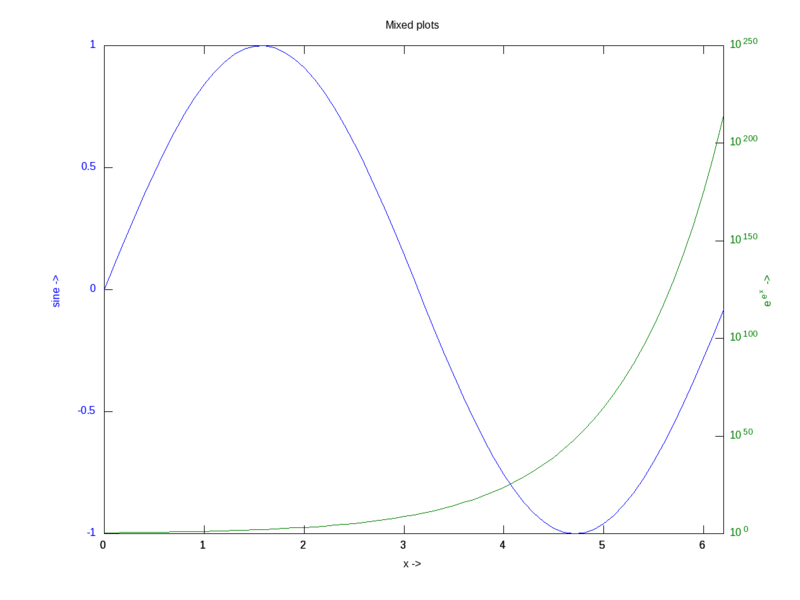 The most basic plotting is using the plot() function, which takes the Cartesian x & y values. Additionally, you may pass, as how to plot, i.e. as points or lines, their style, their colour, label, etc. 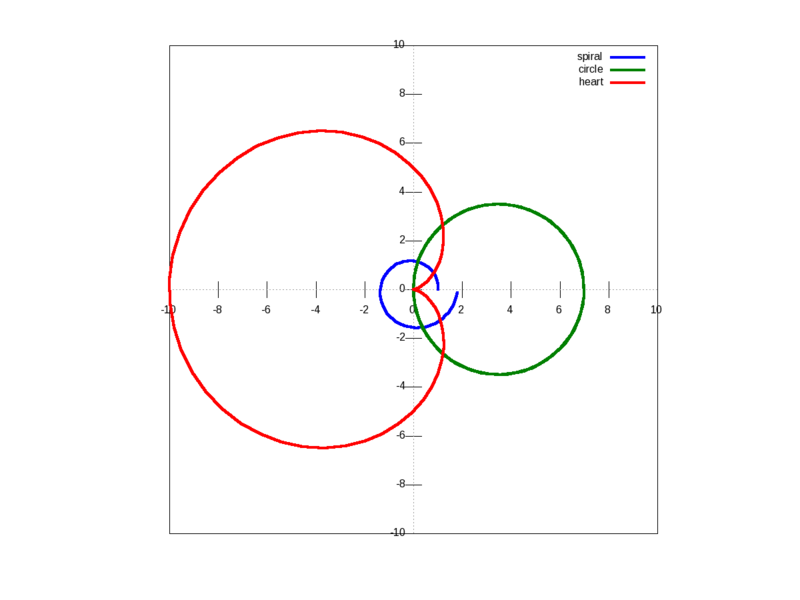 Supported point styles are: +, *, o, x, ^, and lines are represented by -. Supported colours are: k (black), r (red), g (green), b (blue), y (yellow), m (magenta), c (cyan), w (white). 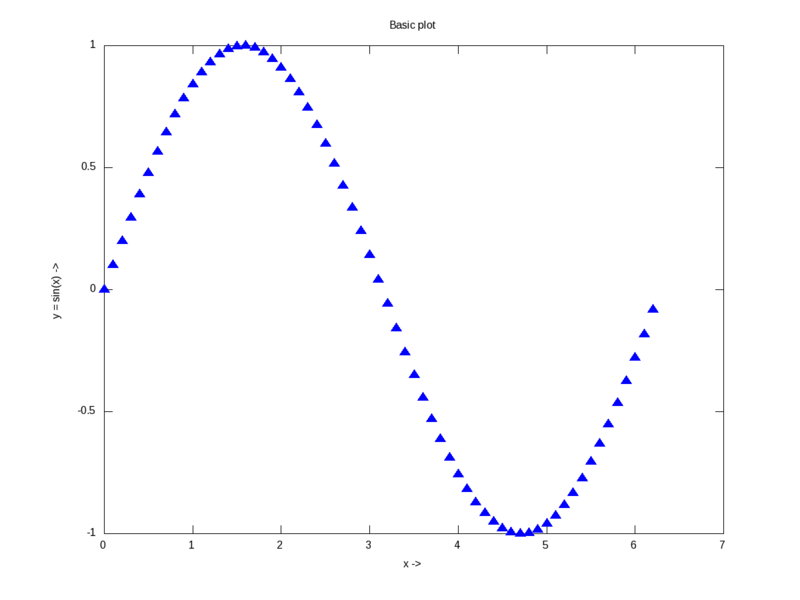 With this background, here is how you plot a sine curve, and Figure 12 shows the plot. xlabel(), and ylabel() adds the corresponding labels, and title() adds the title. Multiple plots can be done on the same axis as follows, and Figure 13 shows the plots. Note the usage of legend() to mark the multiple plots. Note the usage of subplot(), taking the matrix dimensions (row, column) and the plot number to create the matrix of plots. In the example above, it created a 2×1 matrix of plots. As add-ons, we have used the grid(“on”) to show up the dotted grid lines, and print() to save the generated figure as a .png file. It is not always easy to plot everything in Cartesian co-ordinates, or rather many things are easier to plot in polar co-ordinates, e.g. a spiral, circle, heart, etc. The following code & Figure 15 shows a few such examples. 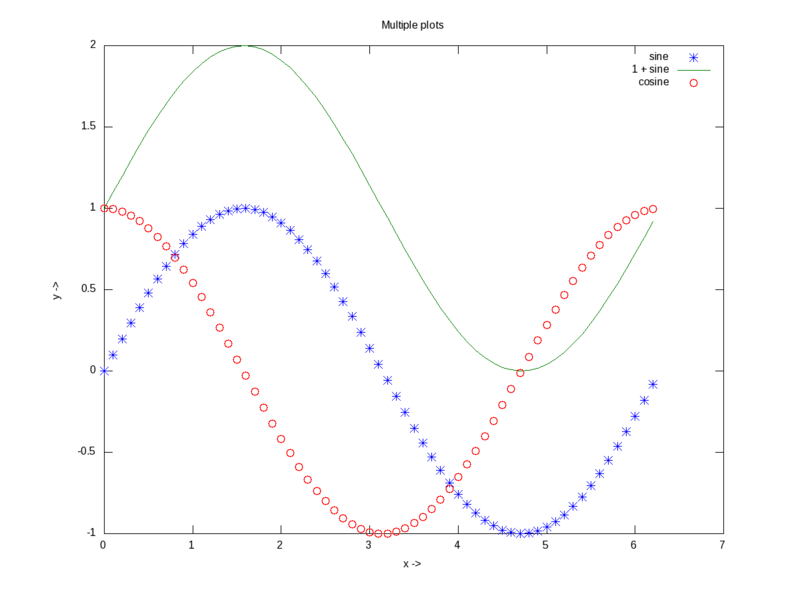 Shown along with is a technique of modifying the figure properties, after drawing the figure using the set() function. Here it modifies the line thickness. There are many other possible ways of drawing various interesting 2-D figures for all kind of mathematical & scientific requirements. So, before closing on 2-D plotting, let’s look into just one more often needed drawing – plotting with log axis, and more over with two y-axes on a single plot. The function for that is plotyy(). Note the plotyy() calling the corresponding function pointers @plot, @semilogy passed to it, in the following code segment. 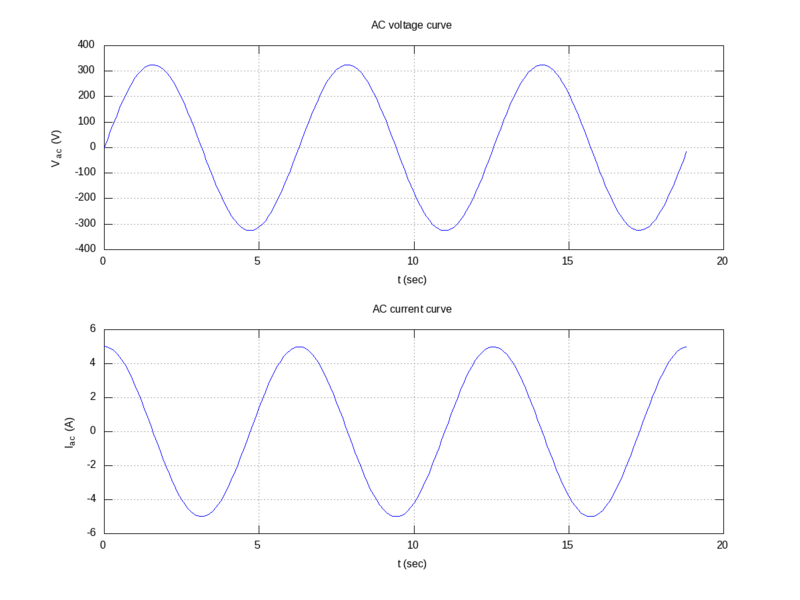 Figure 16 shows the output. Hope you enjoyed the colours of drawing. Next, we would look into octave from a statisticians perspective. This entry was posted in Mathematics and tagged Figures, Graphs, LFY, Linux, Maths, Octave, OSFY, Plots on January 1, 2014 by Anil Kumar Pugalia.